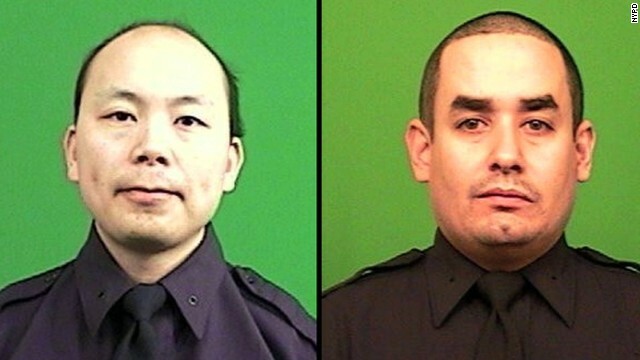 Passions flare over New York cop killings. North Korea warns Sony hack isn't the end. And a Florida State panel clears Jameis Winston. Complicated feelings: The killings of two New York police officers over the weekend sparked passionate responses. Former New York Gov. George Pataki and police union officials quickly lashed out at New York Mayor Bill de Blasio. The governor accused de Blasio of putting officers' lives at risk because the mayor supported recent protests over the killing of Eric Garner by a New York police officer who was not indicted. Former New York City Mayor Rudy Giuliani said Pataki was wrong for making those comments, calling it "an overreaction." Social media users joined the fray, with many objecting to blaming anyone other than the gunman for the killings. Some turned to hashtags #BlackLivesMatter for Garner and Brown - and #BlueLivesMatter to show respect and support for police officers. A contradiction? : While North Korea is denying any involvement in the hacking of Sony Pictures, it's also warning the United States that more is to come. "Our toughest counteraction will be boldly taken against the White House, the Pentagon and the whole U.S. mainland, the cesspool of terrorism," a report on North Korea's state-run KCNA said. On Friday, the FBI pinned blame on North Korea for the hack into Sony's computer systems. In an interview broadcast yesterday on CNN, President Obama called it "an act of cybervandalism," not war. He said that the United States is going to review whether to put North Korea back on a list of states that sponsor terrorism. What about Santa's "Naughty or Nice" list? Charges filed: Police have charged a 37-year-old woman with eight counts of murder in Friday's deaths of eight children in the northeastern Australian city of Cairns. She remains under police guard at a hospital, where she is recovering from lacerations, authorities said. She appeared before a magistrate in a bedside hearing yesterday. The children were between ages 2 and 14, Queensland police spokesman Bruno Asnicar said. The woman was the mother of seven of the children. The eighth child killed was a niece, Asnicar said. The children had five fathers, who are all shocked and devastated, authorities said. Hmmm: Last week's spy exchange with Cuba came with a pregnant pause. Cubans gasped when Gerardo Hernandez greeted his obviously pregnant wife. Since 2001, he had been serving a double life sentence in a U.S. prison. So how did this happen? Hernandez says he's the baby daddy and government officials agree. During the negotiations to free him and other Cuban spies, Hernandez's sperm was collected and sent to Cuba, where his wife, Adriana Perez, was artificially inseminated. The U.S. Justice Department confirmed the story, without going into the details. Hernandez said their baby daughter is due to arrive in two weeks and they will name her Gema. Winston cleared: Florida State quarterback Jameis Winston has been cleared by a school panel that considered whether he violated the student conduct code two years ago when he allegedly sexually assaulted another student. The independent hearing officer on the panel, Major B. Harding, a former chief justice of the Florida Supreme Court, ruled that "in sum, the preponderance of the evidence has not shown that you are responsible for any of the charged violations of the code." Florida State will play Oregon in the Rose Bowl on January 1. The winner will advance to the National Championship game against either Alabama or Ohio State. - Riffing on the news: "Dr. Evil," aka Mike Myers, interrupted "Saturday Night Live" over the weekend to slam both North Korea and Sony. - Interspecies smackdown: Fred the cat has his paws full with his tortoise housemate. - 3, 2, 1, boom! : Texas A&M implodes part of its football stadium to make way for a $450 million redevelopment project. - Top this: The best Jenga move EVER! - A true friend: A monkey struggles for 20 minutes to revive his primate buddy who was knocked out by touching electrical wires on train tracks in northern India. I stopped following everyday once the videos were removed a few weeks ago. Glad to see them back again!